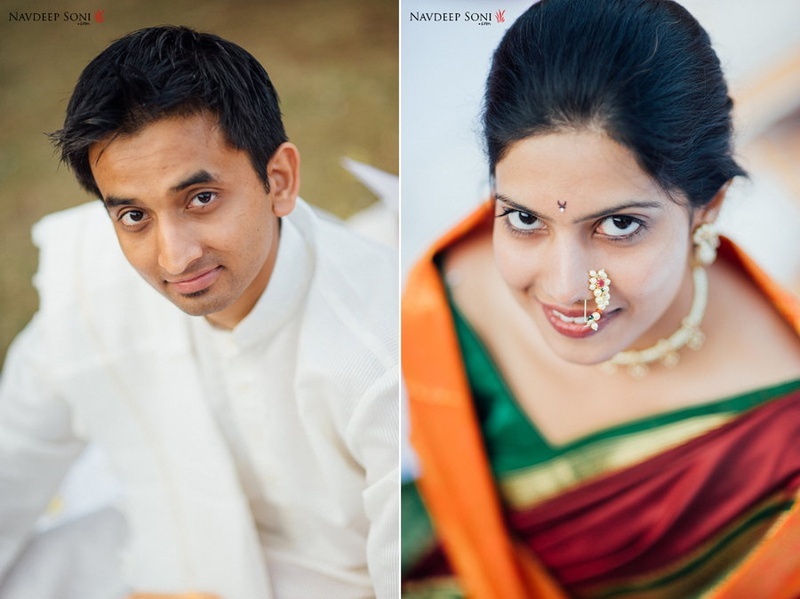 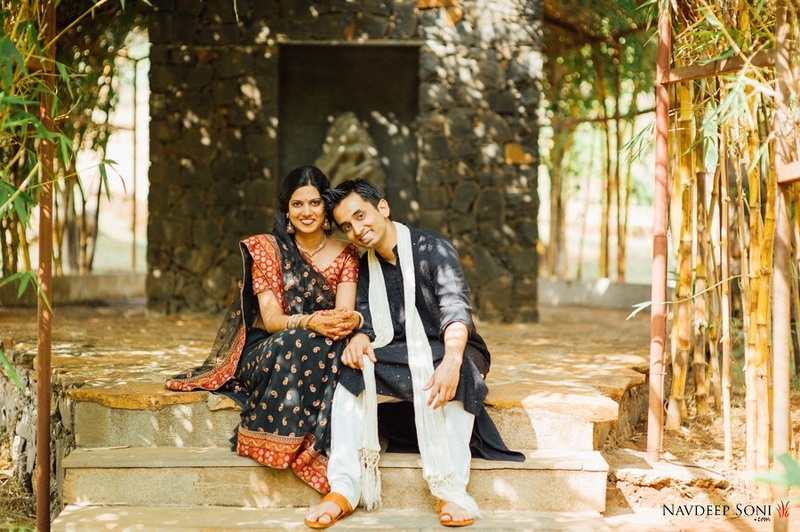 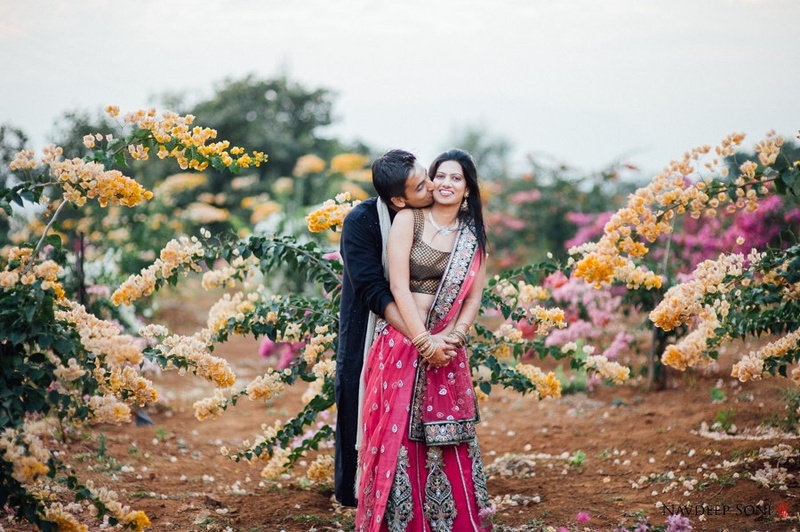 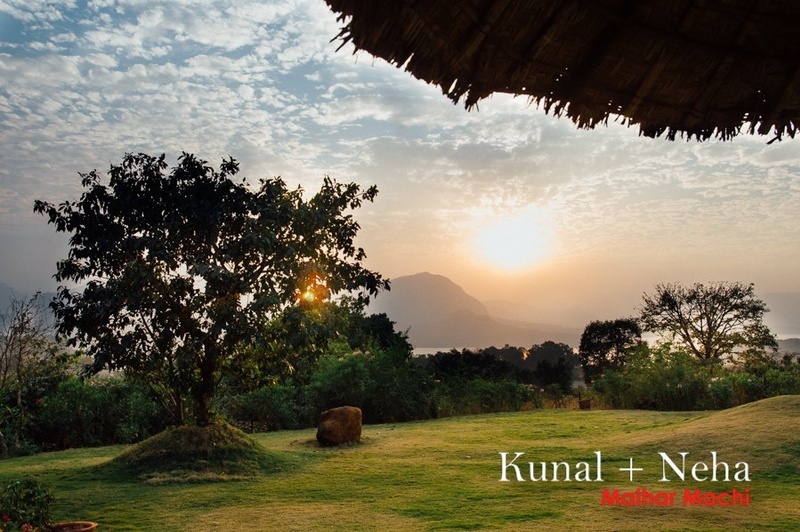 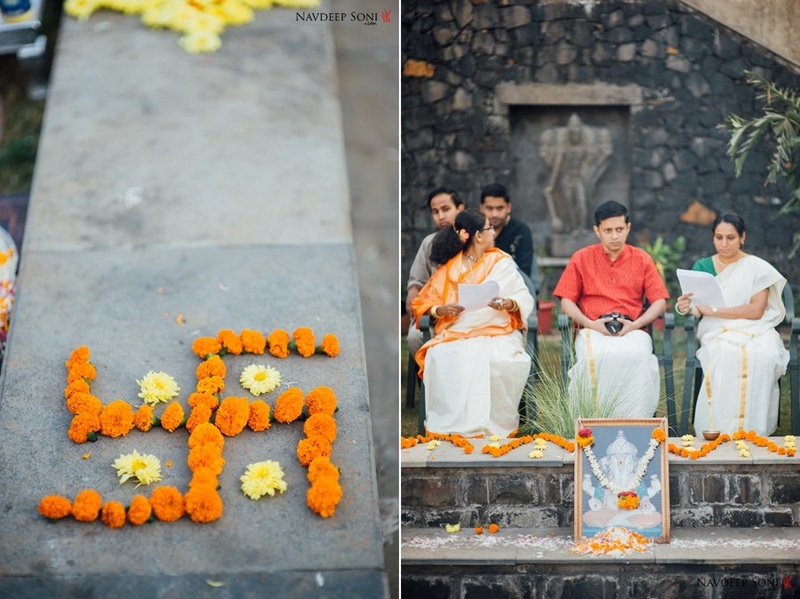 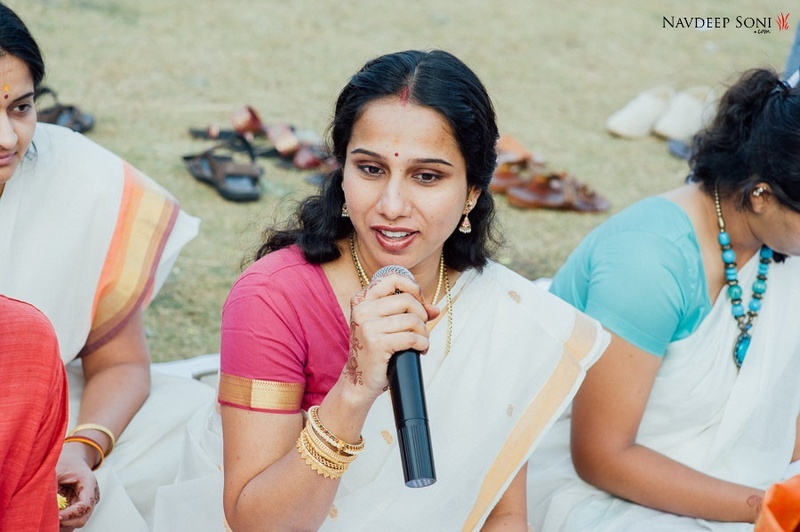 ­­­­­­­­­­­­­­­­­­This two-day destination wedding was held in the clean, green abode of Malhar Machi, Pune where this couple took their Saat Pheras. 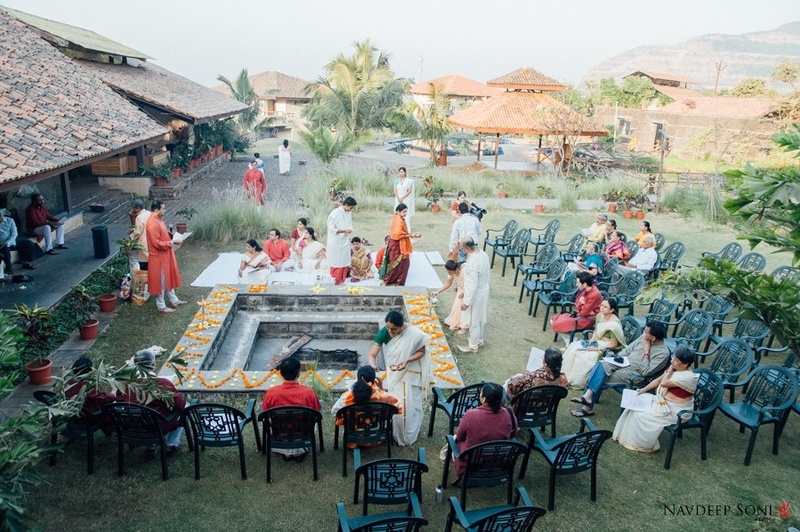 It was a typical Puneri Maharashtrian wedding with a total strength of eighty people only – talk about changing the Indian wedding scene! 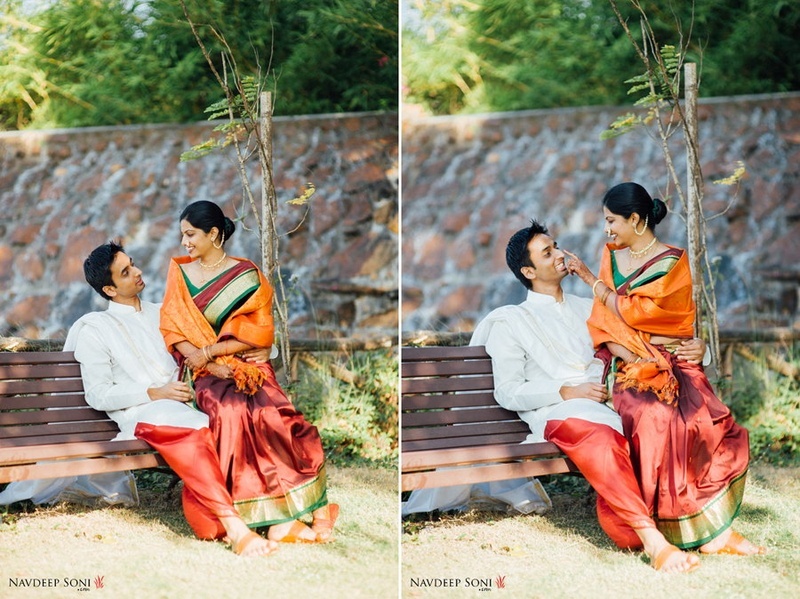 We adore the closeness and intimacy of Neha, Kunal and their families, it definitely made this marriage celebration all the more special. 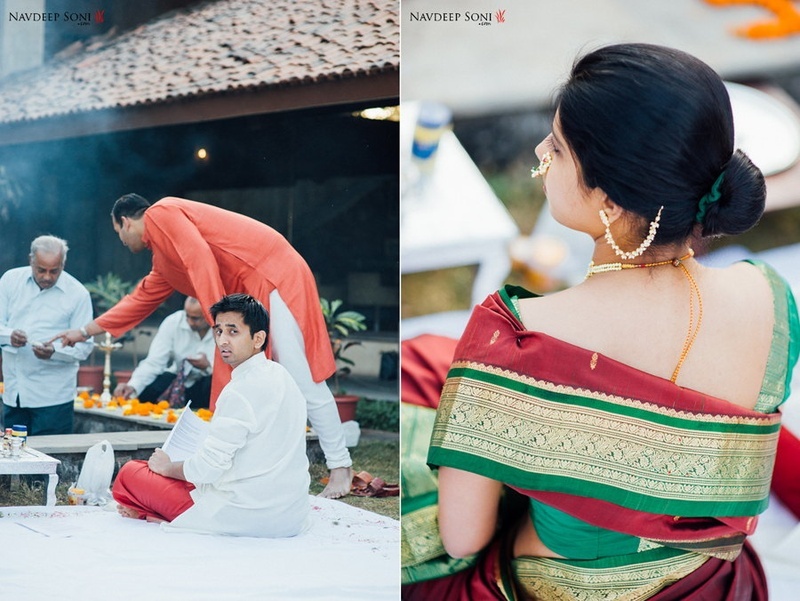 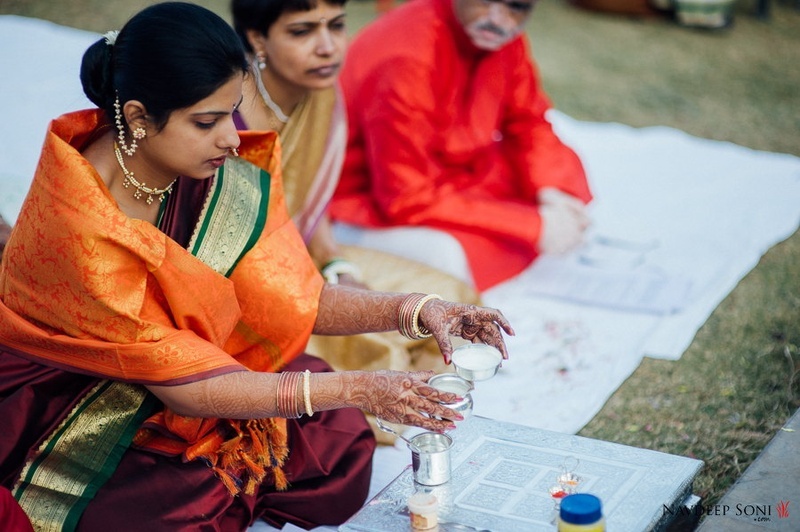 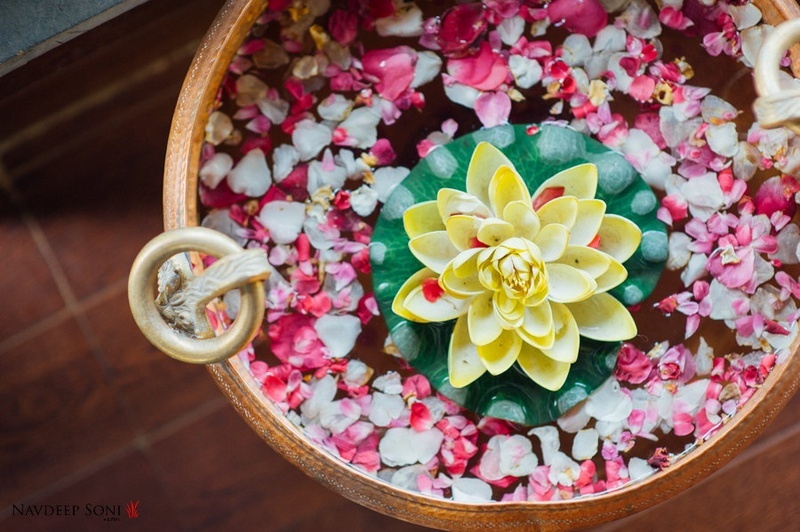 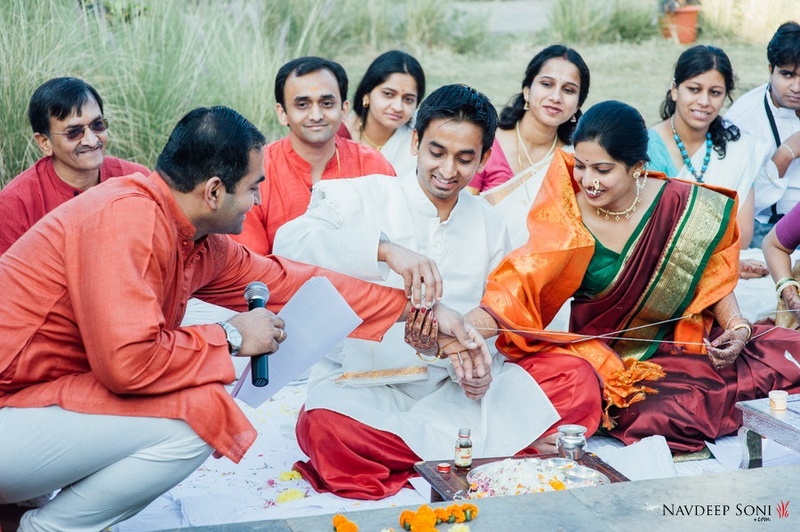 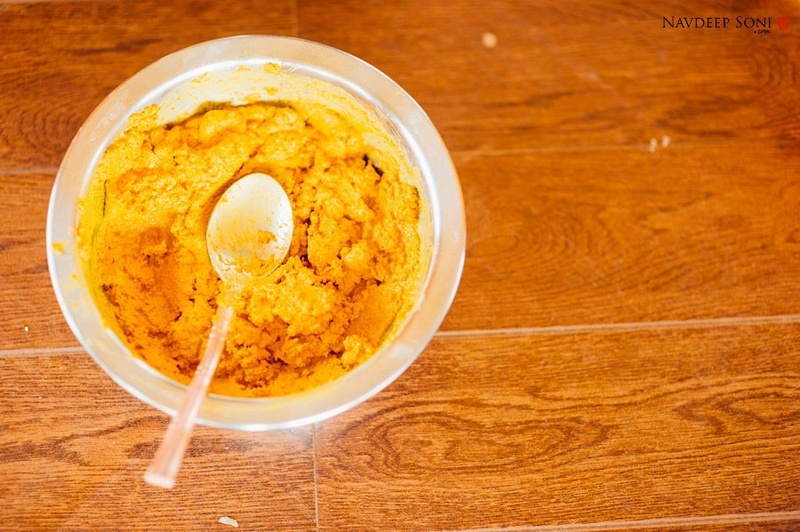 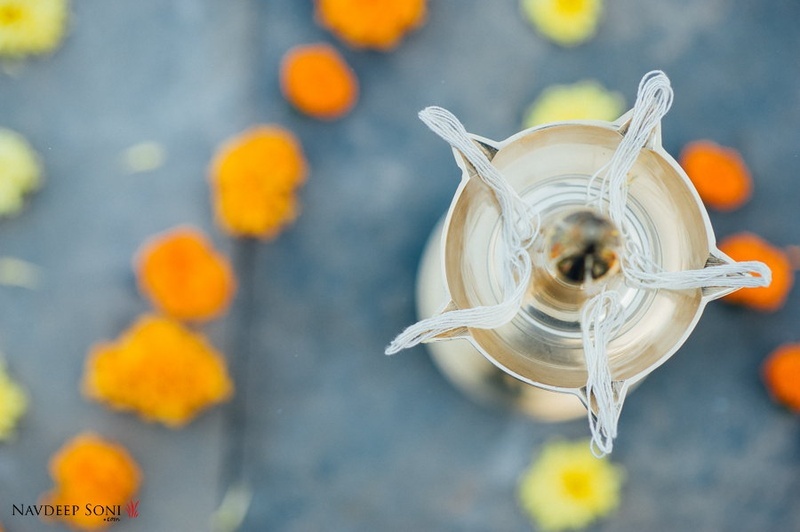 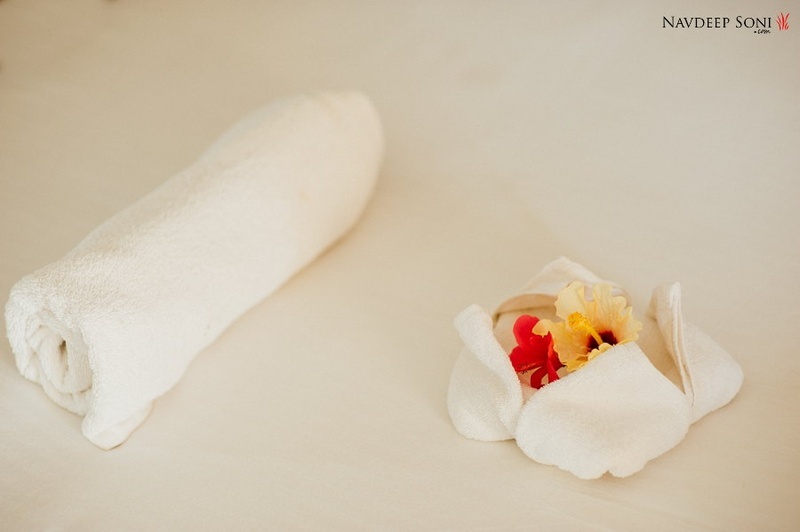 The first of this intimate two-day wedding affair began with the Haldi ceremony for the couple. 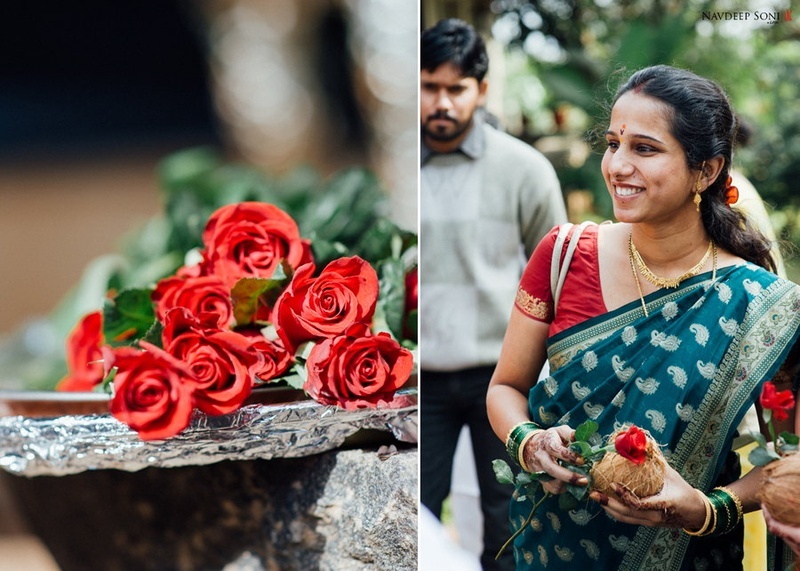 Neha looked beautiful in an orange and red banarsee silk saree with a gold woven border, styled with a simple updo pretty-d up with Rajnigandha flowers. 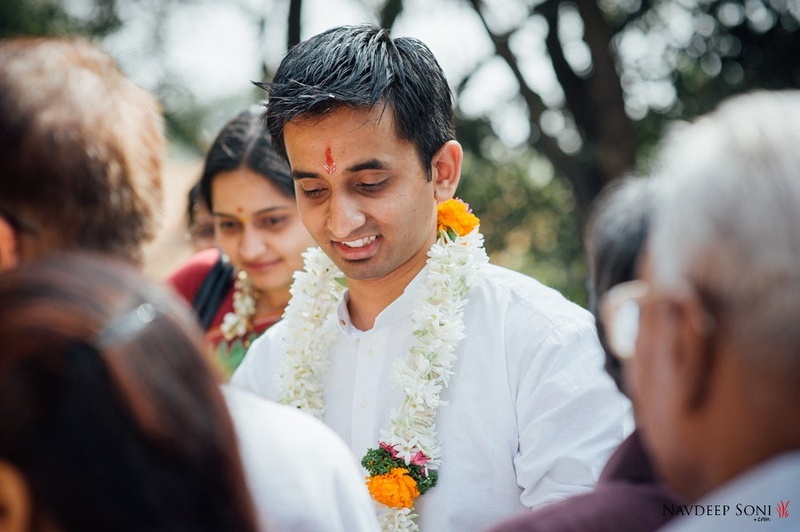 Kunal, went au-naturale, of course and was quite literally drenched in the holy yellow paste – which made for excellent photographs. 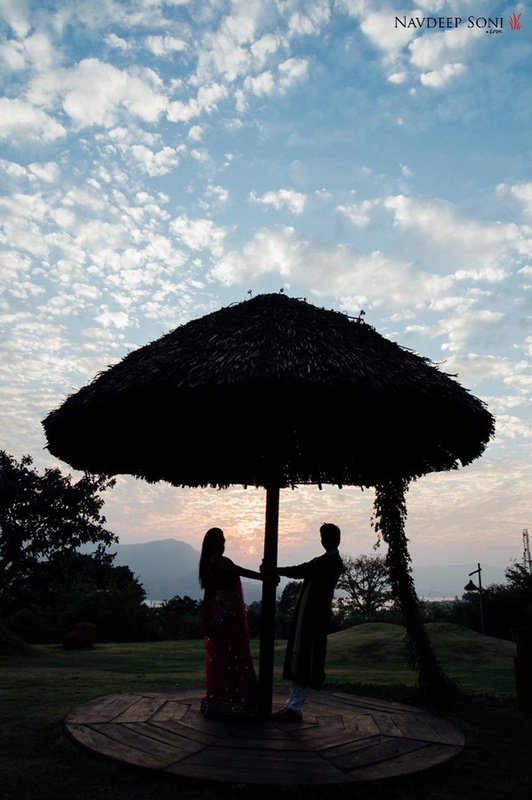 Ace photographer Navdeep Soni shot beautiful moments from this wedding with excellent taste and an eye for detail that no one else could have seen. 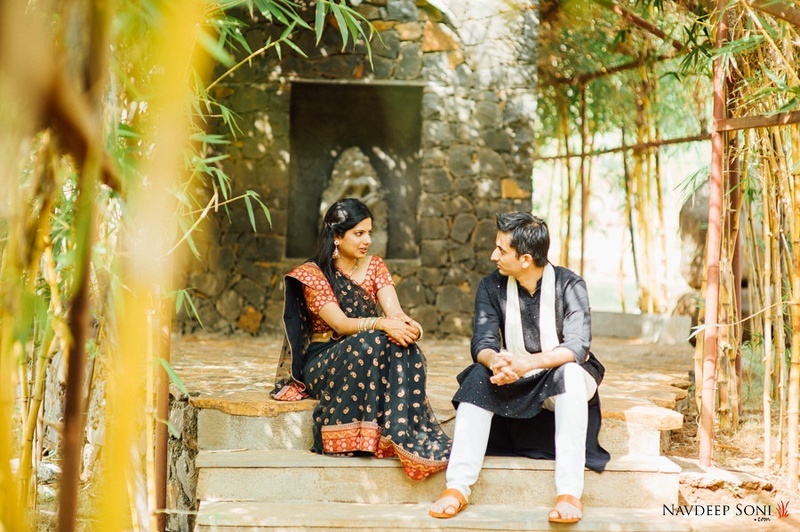 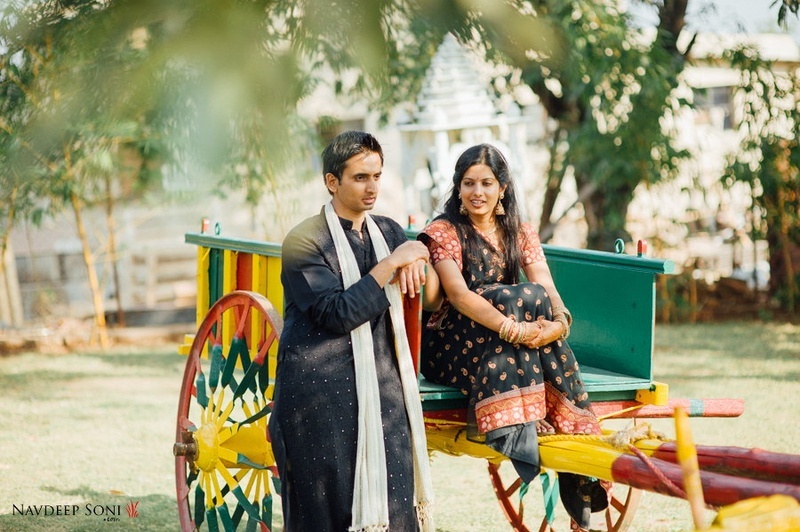 He used Neha and Kunal’s free time on the first day for a quick pre-wedding shoot, which was almost effortless as this beautiful couple were such naturals in front of the camera. 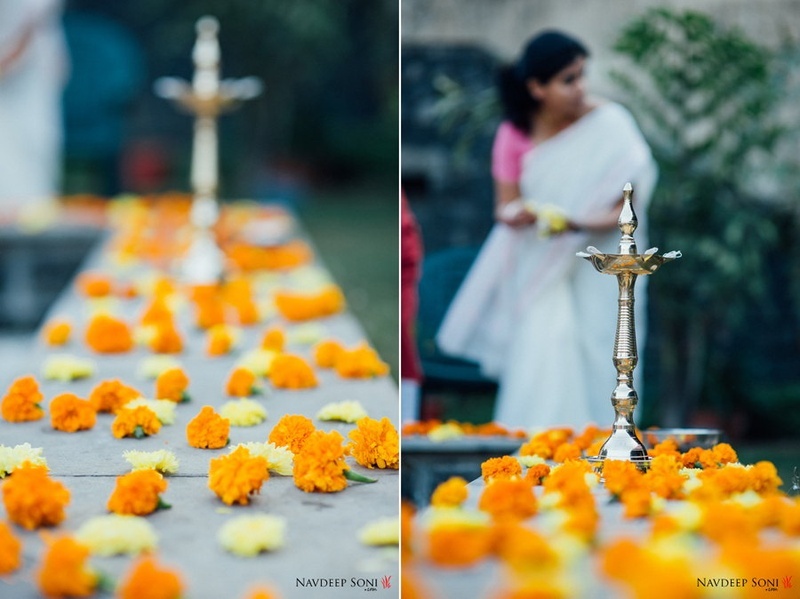 The wedding was made up of all things elegant and minimal. 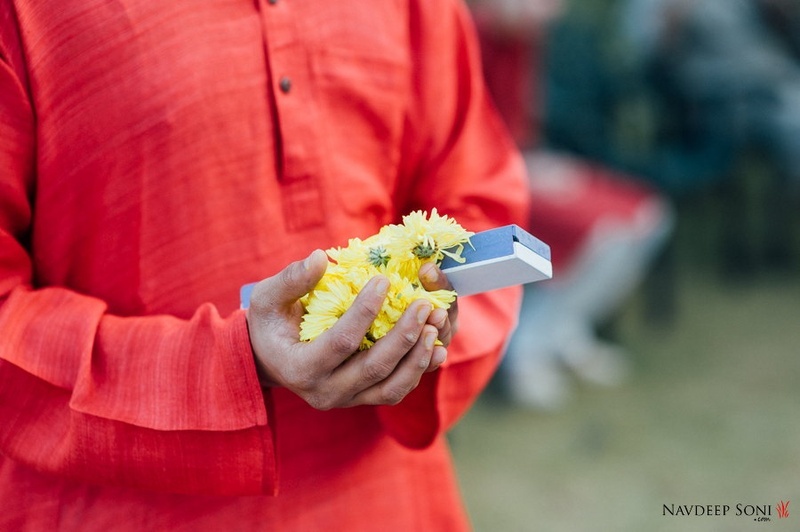 Orange Marigold flowers arranged in a Swastik formation, yellow and orange flower petals laden on the grass and red roses handed out to all the women – it was a freshness filled affair. 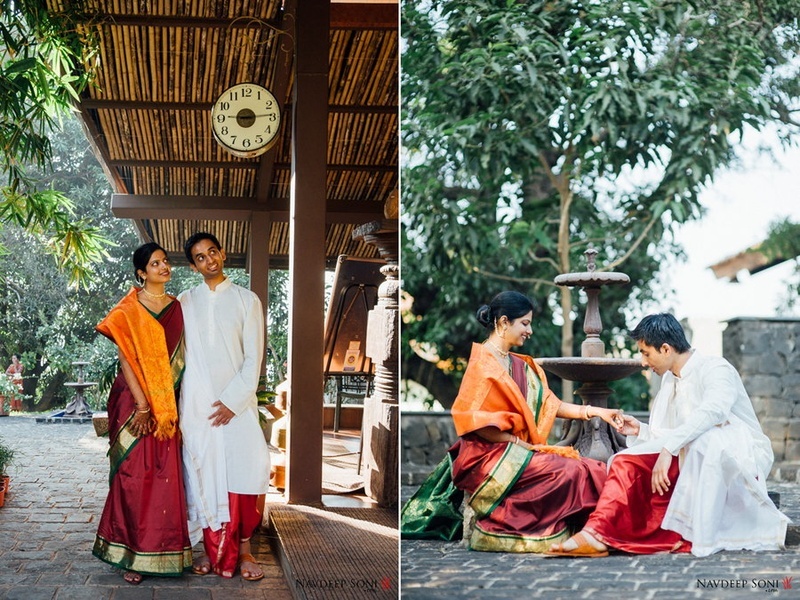 Neha made an elegant bride dressed in a maroon and green nauvaari saree adorned with a gold woven border and orange shaalu with simple gold jewellery and minimal bridal makeup, while Kunal wore a white silk kurta and red dhoti – we lovelove the color coordination of this couple. 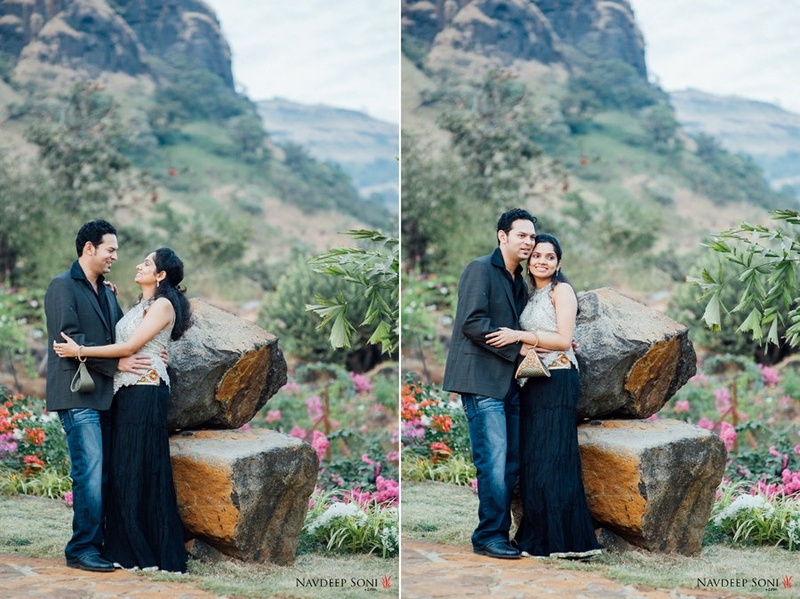 After the wedding was over, Navdeep snuck them away for some beautiful photographs at picturesque locations around Malhar Machi, Pune. 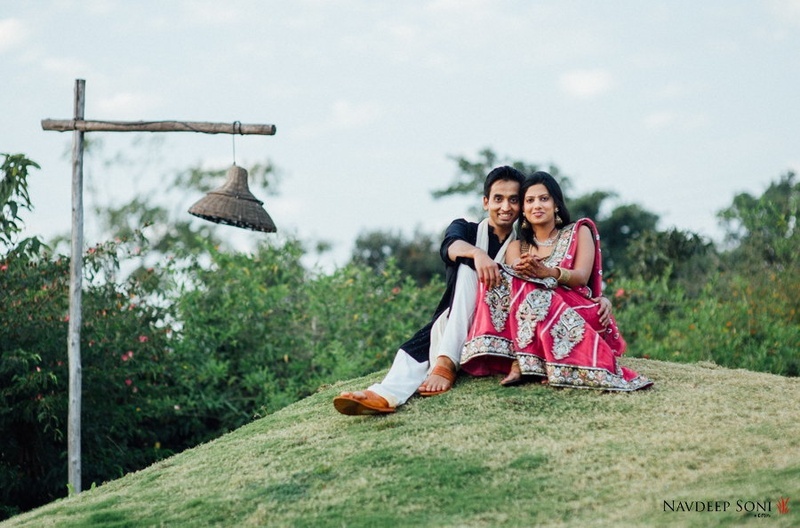 Among grand hilltops, blooming flowers and old vintage clocks, he brought a timeless, simple feel to the post-wedding shoot pictures. 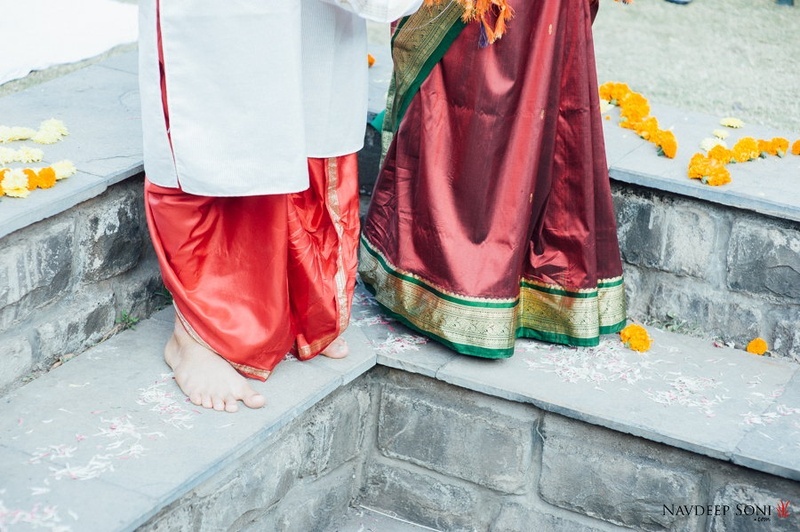 What we especially loved about this simplistic destination wedding was how the entire wedding party that consisted of eighty people were all color-coordinated in hues of maroon, white and gold. 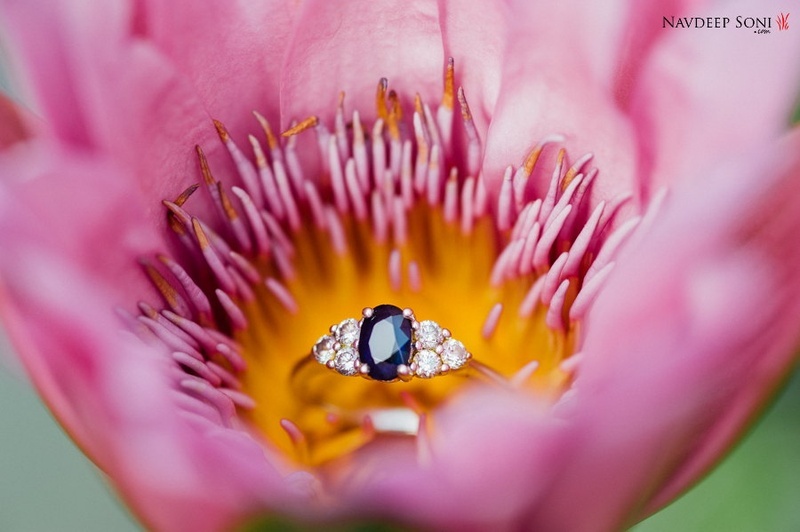 It brought a feeling of unison and looked oh-so-gorgeous altogether. 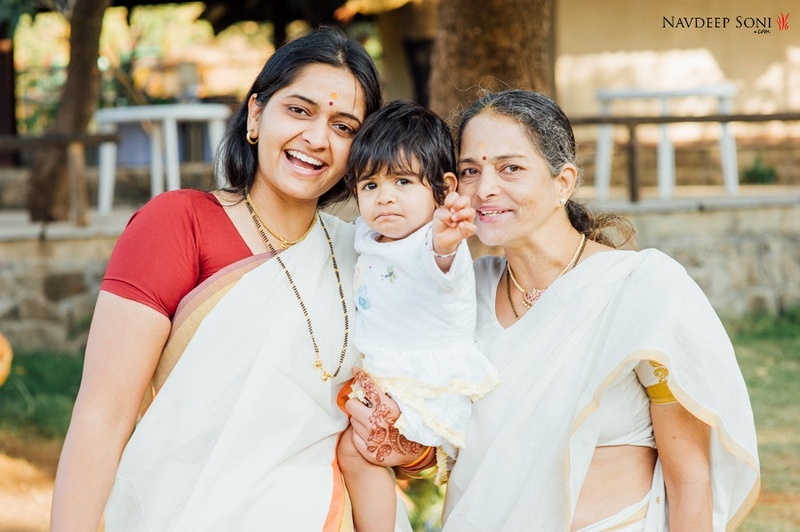 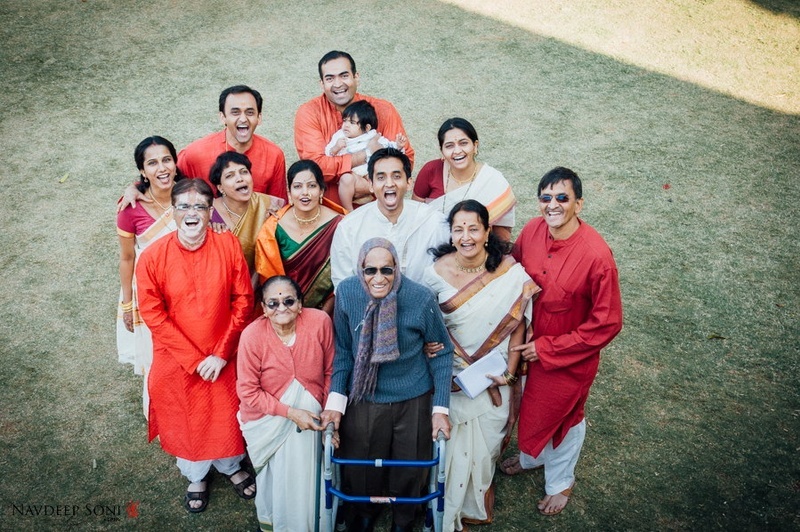 Check out the family group photos with the grandies too – absolute sweetness! 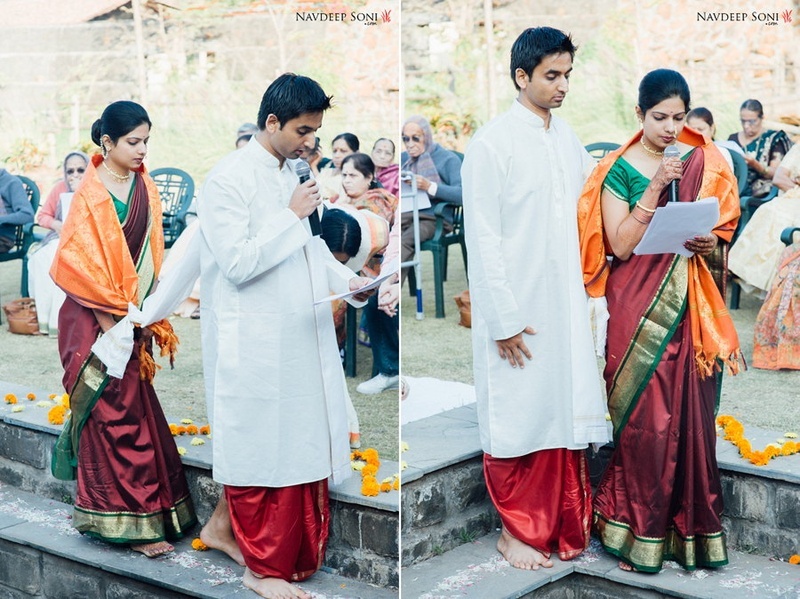 Green wedding ceremony with eco friendly celebrations!